The Charleston is a style of swing dance that was very popular in the 1920’s with both men and women. The Charleston dance is often associated with ‘flappers’, the young women of the post World War one era who flaunted the conventions and etiquette of the day with their clothing and attitudes. In the roaring twenties, the Charleston dance became a craze for a new generation. These young adults wanted a freer dance form than dances like the Polka, the Two-Step and the Waltz that their parents and grandparents danced to. The Charleston dance is known for its rapid paced leg swinging and big arm movements. The dance style became popular when it appeared in the 1923 Broadway musical ‘Running Wild’. This flexible dance style can be performed solo or with a partner and is a dance style that gives the dancer a lot of room for improvisation. The origins of the Charleston dance came out of the same African-American dance culture that produced other swing era style dances such as the Juba which was also popularised appeared in the Broadway musical ‘Running Wild’. The Charleston dance was named after a song of the same name. A precursor of Lindy Hop and often danced interchangeably, Charleston has enjoyed a recent resurgence thanks to the popularity of Roaring 20s period films such as Baz Luhrmann’s The Great Gatsby. This iconic dance style was the tops with the rebellious Flappers and represented the uninhibited enthusiasm of a new generation. This worldwide dance craze was so scandalous and exuberant, it was banned from many reputable dance halls in the 1920s. Naturally, this makes the dance even more appealing nowadays with Charleston enjoyed widely in both partnered and solo dancing. Looking for a Charleston Dance School on the Gold Coast? 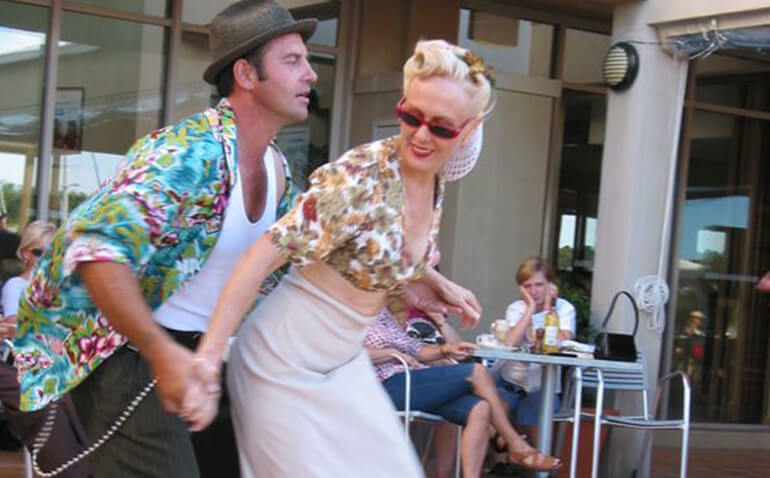 The modern-day Charleston dance is popular around the world and is often integrated with the moves of the Lind Hop. If you’d like to learn how to do the Charleston dance why not come along to a class at our swing dance school. We have classes over three evenings on the Gold Coast, Toowoomba and Bangalow (NSW). We welcome all ages and experience.